Completely re-vamped for 2019, the corporate program offers both tiered pricing for different size groups, as well as customizable add-ons to personally tailor your experience to your party’s needs. Dedicated My FirstFondo / My NextFondo coach & training clinic at your company’s time + location of choice. Private charter bus post-event, flexible pickup and dropoff. Each bus can accommodate 10 riders + bikes + luggage. Fully-assembled 10×10 tent & 10×10 lawn hosting area for your company in Celebration Plaza. 2019 jersey with a “your logo here” option. Minimum 10 jersey order, purchasable until July 15, 2019. – Contact form: Get a quote + apply. – Talk to a human? Email us. The Team Challenge is a friendly way to bring a bit of competition to RBC GranFondo Whistler. 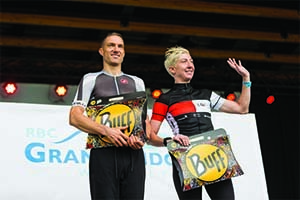 Unlike the St. Regis Cup, there’s no ability level requirements, and teams of 5-8 riders in the Gran Fondo or Alta Classe Gran Fondo categories are eligible to win prizes (plus some serious bragging rights). Ride with friends and family in the GranFondo, Forte or Medio category as a team. Riders can form teams of 5 to 8. The top 3 teams of 5 to 8 in the GranFondo and (new!) 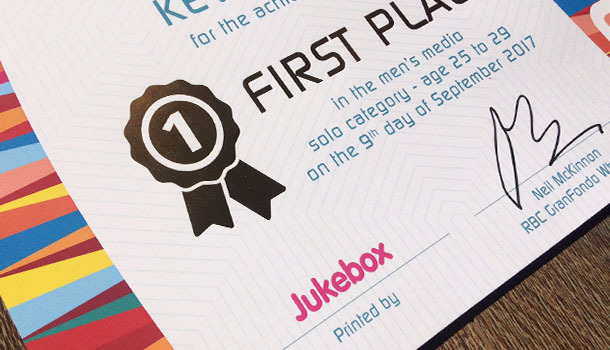 Forte category will receive a commemorative certificate courtesy of Jukebox Print, which you can choose to have sent to you after the event. Compete as a team of two! Create a team of two, either mixed, women’s or men’s, and challenge yourselves to get the best time. The top three teams of each category will be posted on the official results page. Please note, there is no prizing for the Pairs categories. It’s easy to create a team, whether corporate or regular. Simply click Event Registration Page link below, sign into your CCN account, click on the Register A Team button on the bottom left and fill in all the information. Deadline for team changes is August 27, 2019.